Hiring managers give only their 3-5 seconds to scan through an applicant’s resume. If they don’t find something catchy, they’ll put it straight to the reject folder — or worse — the shredder. So how can you assure your resume will not make you wait in vain? Your ace is an updated resume. Here, follow these brilliant resume update tips to give yours a stunning makeover. Most resumes use the Times New Roman or Arial font. An easy way to make your resume stand out is by trying different fonts that are still professional. Calibri, Cambria, Tahoma, Verdana or Century Gothic are good alternative fonts. Check and double-check for typos, spelling and grammar errors. Either use periods or don’t—pick one way and go with it throughout the entire resume. Trust me, just don’t! Some employers won’t even consider a resume with a picture due to Equal Opportunity and discrimination laws. Does the help wanted ad include information on what they’re looking for? Match the job requirements to your qualifications. (For example, state their requirement and then explain how your qualifications meet that requirement). Here are a few suggestions: streamlined, implemented, planned, led, organized, managed, created, developed…you get the idea. Instead of saying, “Responsible for leading an action team to address employee concerns,” say, “Led an action team to attack employee satisfaction concerns, reported feedback to management and suggested solutions to improve employee morale.” See how the first one is very passive and the second one gives a very descriptive picture of the task? It’s great that you enjoy working out in your free time and that you’re active in your church, but it’s not really relevant to your career. Stick to naming activities and accomplishments that are significant to the job requirements or highlight your qualifications. Ensure you’re providing accurate information. Falsification of information on your application is a good way to get fired before you’re actually hired! It’s good to “brag” about your experience and achievements but don’t lie. Try to keep it to two pages. One page resumes are a bit unrealistic unless you use a tiny font, but most hiring managers won’t read past two. 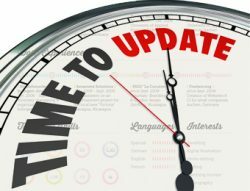 Why Do You Need to Update your Resume Now?